‘When people came to the Muzic Box they specifically came there for one reason: to get their jack on. 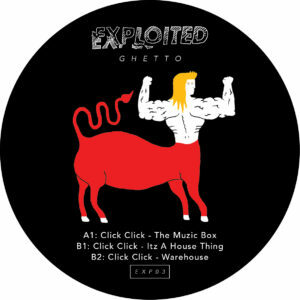 They came there to sweat and to listen to music.’ A tribute to the beginning of Chicago Deep House with a modern twist put into an EP of 3 tracks – a slice of electro-funk, feel good house and warehouse breaks. A homage to the infamous nightclub ’ The Muzic Box’ (former name ’ Warehouse’) from Chicago where Jackin’ was developed with a smile on your face. Click Click has been one of Berlin’s best kept underground DJs. We have been enjoying his DJ-sets so much it was natural we asked for a release. When he dropped ’The Muzic Box’ for the first time, Shir Khan immediately wanted to sign the track and there we go! The last 2 years saw him releasing records on Green Velvet’s/Cajmere’s Cajual Records, San Franciscos OM Records or his own label Kassette Records (which he co-runs with M_Ferri). With upcoming tracks on Steve Lawlers VIVa MUSiC plus regular DJ Gigs at Berlin’s Watergate and Stattbad Wedding or Sao Paulos D.Edge, the future is looking bright for this very talented producer. Lets Jack. Say it loud.